Cat owners very well know the struggles of maintaining a litter box. No matter how clean you keep it, there always seems to be a nasty smell emanating from it and you always seem to be finding bits of litter in the most random places in your home, like the stove or in between the buttons on the TV remote. Now, it’s a whole other issue if your cat stops using it. As cat owners know, it’s no doubt that felines can be very finicky—especially when it comes to their litter box. If their box isn’t up to their standards for a variety of reasons, you might be finding little surprises around your home. If you’ve been dreaming of a litter-free home, the Litter Kwitter may be your best option! First thing’s first, it may be a medical problem such as a urinary tract infection or Feline Urethral Obstruction (FEO), which is a potentially life-threatening condition where concentrated urine crystallizes and clogs the urethra. If your cat is not using the litter box and you suspect it’s a medical issue, contact or take him to your veterinarian. Dirty litter box- Cats are clean creatures and they don’t like stepping in their own waste. If their litter box hasn’t been cleaned for a couple days, they might be finding the next best spot to eliminate, which could be your pillow. Small litter box- Maybe the litter box you purchased for your kitten was a perfect size, but now it may be too small for your adult cat to comfortably eliminate. Not enough litter boxes- Homes with multiple cats should have multiple litter boxes. Unfortunately, cats don’t like to share sometimes. New litter- A lot of cats don’t like change and a new litter that smells and feels different may not be appealing to your feline friend. There are many more reasons your cat isn’t using the litter box, ranging from negative associations your cat has with the litter box to your cat having high anxiety and stress levels. Training your cat to use the toilet can make for a happier home for both you and your kitty. Litter Kwitter makes toilet training your cat a breeze! Seriously! 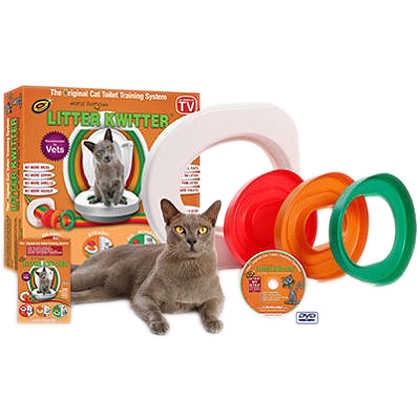 Easily train your cat with the Litter Kwitter training kit. This easy-to-use kit contains the essentials to train your cat to use the toilet in just 8 weeks or less. You could have a litter box-free home in only 2 months. The Litter Kwitter comes with a universal base plate that fits all standard toilets, three color-coded training disks for each stage of toilet training, an instruction booklet, and a 30-minute instructional DVD that has step-by-step directions. Once you start training your cat, he or she will slowly become more comfortable with each stage of training until your home is litter-free. Imagine your guests’ faces when they see your cat politely using a toilet! If your cat is over 3 months old and can confidently jump and balance on the toilet seat, then he or she is a perfect candidate to be toilet trained. Win a FREE Litter Kwitter! 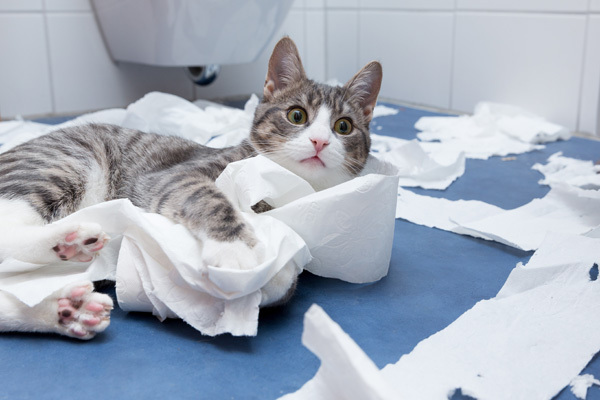 It’s time to leave that litter box in the dust and train your cat to use the toilet! Just leave a comment below and you could win a FREE Litter Kwitter from 1800PetMeds! One winner will be chosen at random on Monday, March 26, 2018, so everyone who participates has a chance to win! (Limited to residents of the U.S.) Good luck! Congrats to the drawing winner, John P! Look for an email from us about claiming your prize. ← Open for a Chance to Win a Free iFetch Frenzy Interactive Dog Toy! Giveaway – wow wonderful. My three dogs would love the stainless steel fountain. This is really neat! At least one (or more) of our cats would be trainable. I have a new rescue and this would be amazing. These two give aways are great, especially if for some reason you are going to be away from home at the scheduled time for feeding. The stainless steel water fountain would be appreciated, as dogs do drink an abundant of water. This would be a dream especially with our own medical issues! We have two cates and three boxes. This sounds great! We have 3 cats and I think they could learn! Thanks for the chance! I would LOVE to try this! With ours, this could help a lot! Thank you for the giveaway! If even 1 cat could learn this, the saving$ would really help me out! I’ve wanted to try one for years! Litter quitter! I gotta have one!!! I always had dogs, but rescued a cat, and I am having fun with her, but would love the opportunity to try something like the litter kwitter.